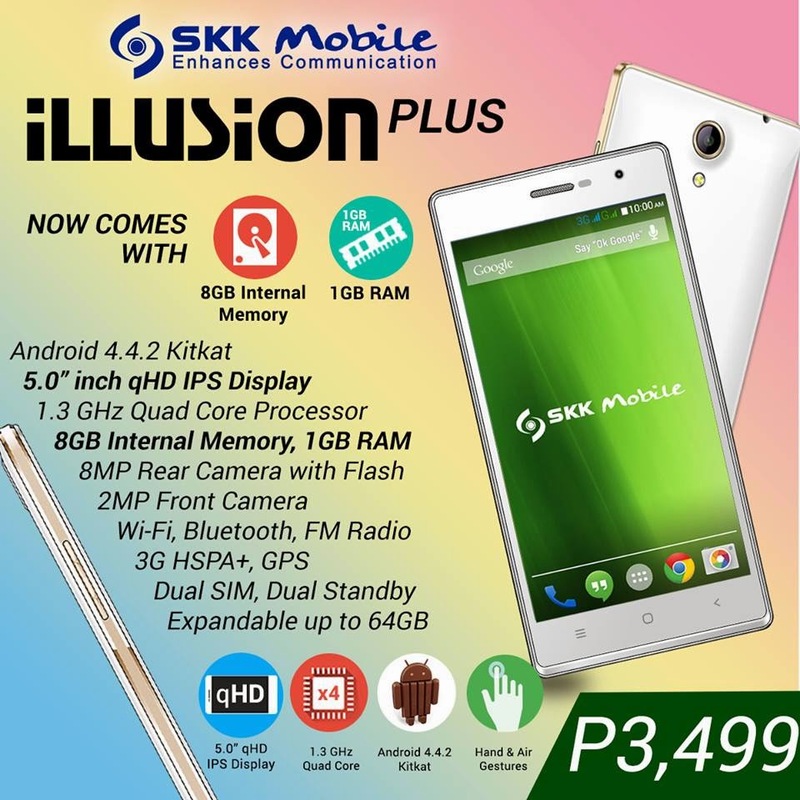 SKK Mobile Illusion Plus is now official with Php 3,499 price tag. And by the name itself, the device is a revamped version of the popular SKK Mobile Illusion released last December. This handset joins the ranks of other sub-4K devices in the local smartphone arena. What is the edge of this handheld over the bucket-full of options in the market? The combination of the quad-core CPU, 1GB of RAM and 5-inch qHD display in a Php 3499 price standpoint make this handset appealing to the masses. We have mentioned that the SKK Mobile Illusion Plus packs 1GB of RAM which is basically double compared to last year’s offering. This smoothens multitasking, gaming and browsing experience. This 5-incher also touts better display with qHD resolution and bigger 8GB of storage than the FWVGA display and 4GB internal memory of the former model. Out of the board, you could also insert up to 64GB using the microSD card slot. MediaTek MT6582 powers the SKK Mobile Illusion Plus, it has a quad-core ARM Cortex-A7 processor ticked at 1.3GHz and Mali 400 MP2 GPU. Likewise, the Android 4.4.2 KitKat will also join the package on the get-go. Other specs include 8MP rear camera, 2MP selfie shooter and 3G connectivity. The phone also features hand and air gestures for ease of navigation. There’s no information about the battery yet, but we will update you soon. Check the rest of the specs right after the jump.